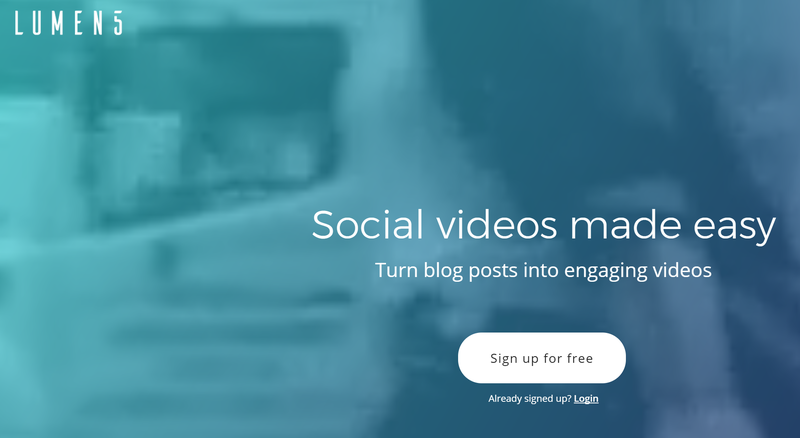 Want to capture people’s attention with video? 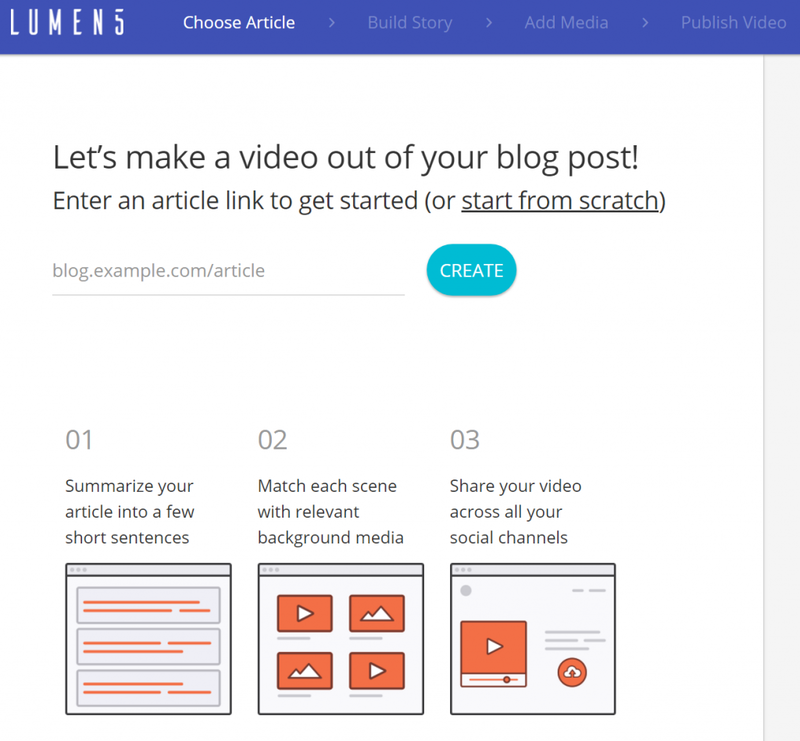 Then Lumen5 may offer you a way to create powerful videos from blog entries, news articles, and online text. If you’re like me, you are not a video designer. I have no idea how to better arrange pictures with quotes to create a video segment, or what accompanying music to use for the soundtrack. Therefore, my videos often lack punch and engagement because I’m uncertain in my arranging skills. 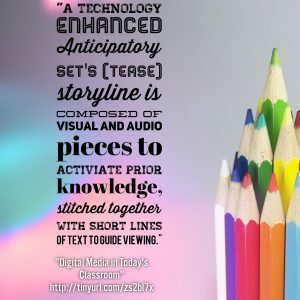 Allow me to introduce you to a tool you can use in the classroom to create a technology anticipatory set. 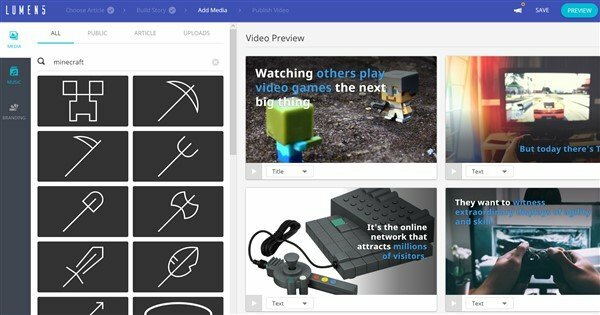 The good news is that Lumen5.com has some absolutely beautiful video arrangements and tools for the video challenged. Take an existing blog entry or web-based text and then let Lumen5 do the rest. Here are two examples that I shared via YouTube. Read the blog entry, Creating Worlds of Tomorrow, from which the video above was created. Here’s another example, Enhancing Parental Access with OneNote Class Notebook. The process is drop-dead simple, allowing you to paste in a website address. You will have the option of grabbing the text from the first section of the article. You can also cherry-pick choice sentences. Each sentence series gets a slide with its own picture. Longer text is split across slides with matching images. You are able to edit sentences once selected for readability. You can put (a.k.a. 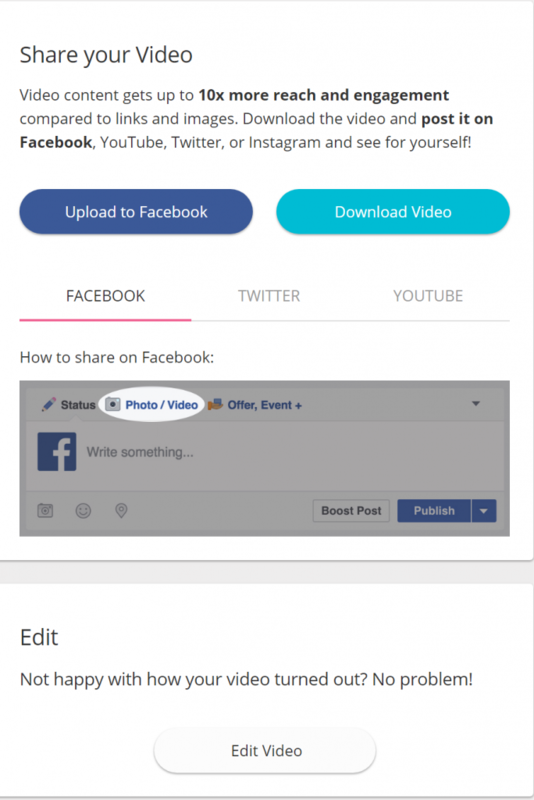 upload) your own pictures in the slides. Another option for finding relevant images involves an internet search, which is built-into the Lumen5 interface. Placing pictures in the slideshow is drag-and-drop easy. In the shot above, you can see the results of an image search with “Minecraft” as the search term. 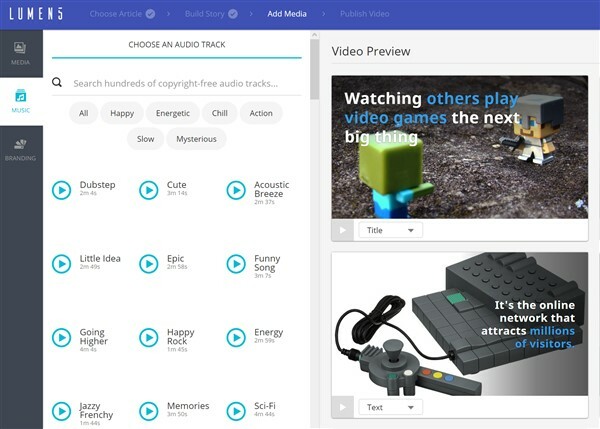 Below, you see stock soundtracks you can add to your video. You also have the option of NOT adding sound, saving the movie as an MP4, and then modifying it in iMovie, WeVideo, Shotcut, or another video editor. Once the video is done rendering, you can save it as an MP4 to your computer/device in anticipation of putting it on YouTube or another online storage location (e.g. OneDrive, Google Drive). It wasn’t until high school that I started figuring out how to read non-fiction text, picking out what text would make it into a test. Now, much of the non-fiction text that students read finds its way online. 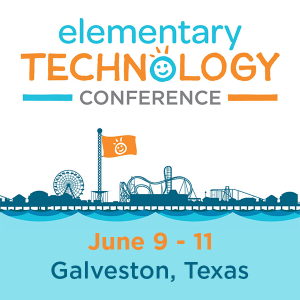 Pull text from anywhere, such as Dogo News, Newsela, Newseum, or Tween Tribune and then paste the web link into Lumen5 for a quick summarization tool. For example, the video below was generated from the Tween Tribune article, Watching Others Play Video Games the next big thing. It might be fun to create a summary of online content using Lumen5. *Note: When I checked with Lumen5 crew, they mentioned that the long rendering time is atypical. Most videos are rendered in ten minutes or less. They asserted that my experience may have been due to some unfortunate server errors they experienced early on. As I recall now, the server did crash while I was using it, so this supports their assertion. Let me know in the comments if your experience matches their assertions. How do you see yourself using Lumen5 in your K-12/adult learning situation? Given the rendering time, it’s not a quick tool to use. Another piece that needs tweaking involves the slide editing component. Although I uploaded a picture, a screen shot of the actual article at Tween Tribune, I was unable to place the picture on its own slide alone. I would have had to replace the image and text of an existing slide. That may just involve some planning ahead, adding slides you don’t need so you can replace the image. One thing is for certain, students can easily adapt the technique Lumen5 introduces with a variety of video editors. Lumen5’s approach serves as an excellent starting point for beginners like me. Preservice Teachers, We Have A Gift for You!